As Islamic bonds become more popular, banks are creating a viable secondary market. Emirates Islamic Bank: Reaping the benefits of a surge in business. Asurge in the issuance of sukuk, or Islamic bonds, and growing demand from global financial institutions and hedge funds for these issues has led to the creation of a viable secondary market. Syndicated sukuk issues of $1 billion or more are no longer rare, but until recently there has been very little trading of sukuk because holders have been reluctant to sell the bonds before maturity. As the market matures, however, and more issues become available for trading, a new dynamic is taking hold. The volume of sukuk issues outstanding globally is expected to reach about $70 billion by the middle of this year, up from $50 billion at the end of 2007. The total could hit $225 billion by 2010, bankers estimate. Kuwait Finance House (KFH), the leading Islamic lender in Kuwait, is taking a hands-on approach to creating a secondary market in Islamic bonds by forming a separately capitalized firm regulated by the central bank that will advise on, issue and trade sukuk. Known as Liquidity Management House, the KFH subsidiary that was established on January 1, 2008, has a fully paid capital of $380 million. 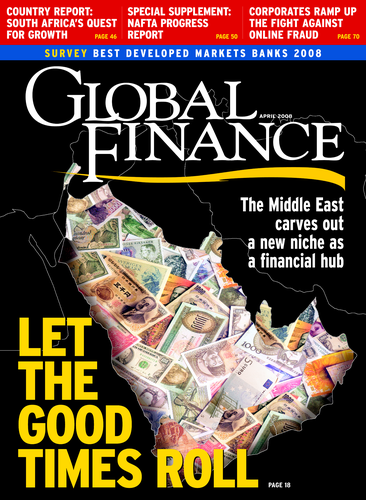 Its chairman and managing director, Emad Yousef Al-Monayea, manager of the international investment department at KFH, says the new firm will promote the global trading of sukuk to provide a new financial instrument that can be liquidated to obtain quick cash at a fair market price, while facilitating the placement of surplus funds by Islamic financial institutions and investors. “We want to promote a secondary market in sukuk and be in a position to provide this service globally,” Al-Monayea says. KFH has been a pioneer in the issuance of sukuk. In 2003 it acted as a co-manager for a $750 million global sukuk issue for the government of Qatar and as co-underwriter of a $400 million sukuk issue for the Islamic Development Bank. KFH also was instrumental in forming the Bahrain-based Liquidity Management Center in 2005 to record and securitize Islamic financial assets and create an active interbank market. Al-Monayea serves as its deputy chairman. Al-Monayea notes that even before Kuwait’s National Assembly late last year approved a long-awaited Commercial Code for Islamic Banking, KFH has structured and arranged Islamic financing deals for Kuwaiti companies on global markets. KFH will now play a larger role in activating sukuk issuance, not only in Kuwait, but worldwide. Iqbal N. Mohammed, senior investment manager at KFH, has been working closely with the Singapore government in creating the legislative and regulatory framework for sukuk financings. He says KFH is about to announce the first Islamic financing of a project finance transaction in Singapore. It will be based on the template for the $1.2 billion financing for Equate Petrochemical in 1996. KFH arranged and underwrote the Islamic lease facility for that landmark transaction. KFH was the first Islamic bank from the Middle East to expand to Malaysia. Its aim is to develop and promote Islamic banking worldwide, Al-Monayea says. KFH is working closely with global investment banks in creating new products. In December 2007 it signed an agreement with Goldman Sachs to create the first Islamic portfolio dealing in commodities. With a capital of $50 million, it operates under the structure of “al-selem,” whereby payment is made immediately but the delivery is later, making it similar to a forward contract. Rising liquidity in the Gulf region due to higher oil prices is helping to feed the growth of Islamic financing at a time when huge new projects and growing regional economies are increasing the demand for funds. The volume of projects to be funded in the region in the next 10 years, either by governments or the private sector, amounts to more than $1 trillion. Syndicated sukuk will be used extensively to finance these projects. Emirates Islamic Bank, based in Dubai, more than doubled its profit in 2007 and has had the highest profit distribution on customer investment and savings accounts in the UAE in the past three years. The bank is growing rapidly in its home market and is preparing to expand internationally. Such fast growth is not unusual for an institution in the early stages of its life, Al-Shamsi says. Emirates Islamic Bank was launched in October 2004 with nine branches. It now operates 23 branches. “Branch expansion is part of our strategic plan,” he adds. Reflecting the strong economy in the UAE, the bank’s assets increased by 25% last year, he notes. “In the next three years, 35% annual growth in assets will be reasonable,” he says. The merger of Emirates Bank and National Bank of Dubai to form Emirates NBD, a national champion for the UAE, will provide a major boost to Emirates Islamic Bank, which will serve the Islamic financing needs of the customers of the merged institution. The Islamic bank launched its debut sukuk international offering in June 2007 under its $1 billion sukuk issuance program. The five-year issue was priced at Libor (London interbank offering rate) plus 30 basis points. Standard Chartered Bank was a co-lead arranger for the issue and handled the books. While the corporate banking division of Emirates Islamic Bank is able to meet virtually all of the needs of a corporate client with its wide range of Shariah-compliant products, it does not offer the equivalent of hedging or derivatives. “All of our products are based on assets,” Al-Shamsi says. “We keep away from any offerings that are not in a pure Islamic environment until it is very clear that there is no danger of violating Shariah rules,” he says. Emirates Islamic Bank is exploring international markets in an alliance with Bahrain-based Al Baraka Bank. The two banks are considering opportunities in such countries as India and Indonesia and likely will enter the Syrian market soon. While Bahrain has more Islamic banks, the UAE has bigger volumes of Islamic financing, Al-Shamsi says. The demand for project financing in the UAE is enormous, and Islamic financial institutions can offer more options than conventional banks, Al-Shamsi says. “The conventional banks offer a single product—loans—whereas Islamic institutions offer various types of partnerships,” he explains. “This is unlike the interest-based commercial banking system, where all the pressure is on the borrower, who must pay back his loan with the agreed interest, regardless of the success or failure of his venture,” he says. Emirates Islamic Bank launched the Danat RIA Fund in February 2008, aiming to capitalize on the booming real estate market in India. The bank will acquire 78% of the equity in Danat RIA, a company established to develop a middle-income township in New Delhi. The profits on the investment will be generated through the sale of undeveloped land and completed housing units.